Click picture to view examples of engine hoists. When it comes to working on your car, few tasks are as exciting, interesting, and intimidating as removing your engine. While removing your motor is a rather in depth and involved procedure, it is actually much more common than one might expect. Some of the more common repairs that necessitate engine removal include clutch replacements on some cars, repairing a blown head gasket, rebuilding a tired engine, or replacing your rod bearings. When pulling your engine out of your car, it takes quite a few tools as one must remove all of the ancillary components such as intake manifolds and cooling hoses to create sufficient room to get the engine out. As such, you’ll of course need a good socket set as well as a myriad of different flathead and phillips screwdrivers. However, when it comes to tools, the undisputed centerpiece of your engine removal tool arsenal is your trusty engine hoist. Why is the engine hoist so important you ask? Well first it’s important to know that the average engine weighs somewhere between 400 and 600 pounds. As such, unless you have a squad of crossfit trainers who have been tailoring your dead lift and you routinely enter strong man competitions, you realistically aren’t going to be able to lift your engine out by hand. Naturally, to compensate you’ll need a tool that is specifically geared towards this end. Secondly, the least safe part of any engine removal procedure is the moment when you are actually lifting the engine out of the car once everything is unbolted. Considering the consequences if your engine were to fall or your hoist were to tip, a sturdy engine hoist is a critical safety item during any engine removal procedure. Before we get started, if you already know all about engine hoists, we have made a quick reference guide to save you some time. These are our favorite recommendations and we think that they will serve you well. If you are looking for more detailed information, skip past the chart and read on! What Is An Engine Hoist? So before we can explain what makes a good engine hoist versus a bad engine hoist, first we must explain exactly what an engine hoist is. An engine hoist, often called an engine crane, cherry picker, or an engine lift, is a tool that is used to remove and install small engines of the car and truck variety. An engine hoist consists of a strong support structure that is most often made out of welded steel or aluminum. It features a cantilever beam extending from the frame that has chain attachments designed to connect the tool to the lifting eyes on your engine. This cantilever beam can be raised and lowered via a hydraulic cylinder. Changing the height of the tool is accomplished by pumping a hand actuated lever. Finally, an engine hoist has casters mounted to it such that it will roll. This allows for the engine to be transported once it has been lifted high enough to clear your engine bay. When/Why Do You Use An Engine Hoist? The obvious answer to when you’d use such a tool is when you want to lift your engine up for any reason. This occurs most often when you want to entirely remove your motor for such tasks as engine repair or an engine swap. An engine hoist is also used to raise an engine just a slight amount to create space for certain repairs. There are also other non-automotive uses that are outside the scope of this guide. Using an engine crane may seem simple, and it is, however there are a few things you should be aware of in order to safely use the tool. Below are some safety tips that you should review prior to using your hoist. 1. Always use proper lifting points when attaching the hoist to your engine. Most engines come outfitted with a bolted bracket that contains a lifting eye. Sometimes it’s not always obvious, but you should study your engine before attempting to remove it in order to try to find this bracket. There are also certain bolts that you can pick up with your hoist so long as they are structural in nature. These typically thread into your engine block and are usually 1/2″ in diameter or more. Never under any circumstance should you attempt to attach your hoist to anything else. It might be tempting to try to attach to various components such as your exhaust manifold or a hose, but these are not designed to support the weight of your engine and if you try to use them, you will either damage the component or worse…injure yourself. 2. Make sure you are using a hoist with high enough capacity to lift your engine. In other words, your engine crane should be rated to lift the weight of your engine. Unfortunately, the weight of your engine is not always published. Fortunately you can search around on internet forums to verify the weight. It should also be noted that unless you have a very large motor, most any engine lift should be sufficient as most are rated much higher than is needed for your average commuter car or sedan. This only really comes into play when you have a large truck or other special circumstance that would make your motor particularly heavy. It should also be noted that if you use any type of engine leveler or chains, these should also have a high enough rating to support your motor. Torin, often marketed as “Big Red,” has been a long standing player in the automotive tools industry. 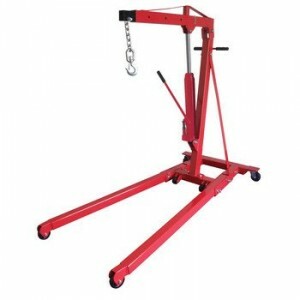 They make floor jacks, jack stands, engine stands, and engine hoists among other tools. They are well known for their quality, and their two ton hoist offering certainly lives up to this reputation. The biggest reason to consider buying this hoist is that it represents by far the highest value of any hoist reviewed below. Sure, there are others that are more attractive or might have a few extra features, but the reality is that for the money there is no better deal out there. First and most important, this hoist is capable of supporting two tons, so it’s easily good enough for anything but the largest cars around. In addition, it’s foldable, which makes it easily portable and very easy to store if you have tight space constraints in your garage. It also features a telescoping boom, which means that you can extend this tool so that the lifting hook sits directly above your engine. It should be noted that lifting capacity drops down incrementally to 1000 pounds at the furthest extension point, but this is still plenty for most cars. 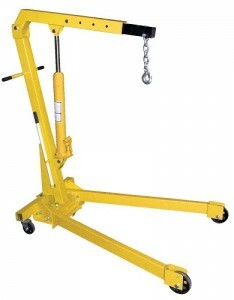 The lifting range is between 1 inch and 78.75 inches, making this hoist tall enough to remove truck and SUV engines. The cherry picker comes equipped with 6 wheels which makes for excellent mobility and great stability. Overall build quality is great, as per the usual from Torin. In the end, you can’t go wrong with this hoist. If after reading this article you aren’t sure which hoist to get, this is the one we most recommend most. Simply put, the Sunex 1.5 Ton with Rapid Rise is an awesome engine lift. The most notable feature is the fact that it folds, which makes stowage easy for those of us with smaller garages. Even cooler is that it folds vertically, meaning it has a very small footprint when it’s time to put this cherry picker away. Of course, the next feature worth discussing is the rapid rise. Essentially the rapid rise is the result of a smart hydraulic setup that gives sufficient mechanical advantage to the user to allow them to raise this hoist a claimed 6 times faster than standard engine cranes. This may not seem like a big deal, but when adjusting the height of your crane prior to removing your engine, it can take quite a few pumps and considering the amount of time it already takes to remove an engine, any time that can be saved is worth pursuing. This crane has a capacity of 1.5 tons with the four position adjustable boom retracted, and a capacity of 750 pounds with the boom fully extended. While this engine hoist has one of the lower capacities in the bunch that we recommend, don’t let that fool you as it is still heavy duty enough to handle most car and truck engines without incident and has some cool added features that more than make up for it. Additionally, mechanics will benefit from the low profile casters as well as the low minimum height. Fit and finish is good, and this piece of equipment looks great sporting its glossy red paint. All in all, this is a fantastic hoist that will serve you well. The fact that the Sunex is backed by a 1 year warranty should only make you even more confident in this particular hoist. 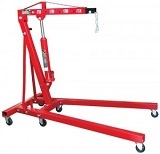 The OTC 4000lb capacity folding floor crane is a fantastic value. The capacity is two tons, which makes this lift ideal for pretty much any economy car, luxury sedan, or truck. It also has low profile front wheels that make it ideal for sliding under cars that are low. The crane has pretty good height range and also has a telescoping boom which allows you the versatility to remove engines from small cars such as a Honda S2000 or large cars such as a Jeep Cherokee. Overall, build construction is good with clean welds and good alignment. The finish is of high quality without any of the typical issues such as cracking, flaking, or chipping that are so often seen on car tools. One of the other more notable features of this hoist is that it can be folded to make it more compact for storage (we really can’t stress enough how convenient it is to have an engine hoist that folds…you’ve probably noticed the pattern in our choices by now). This cherry picker is going to set you back a pretty penny, but the reality is that you gotta pay for the good stuff. On a brighter note, for this kind of coin shipping is usually included, so you don’t have to worry about that. 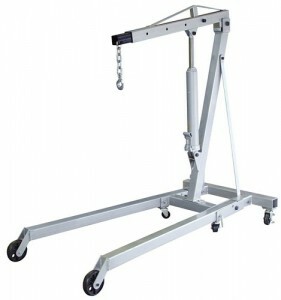 Additionally, OTC makes a 1 ton version of this hoist that sells for a bit less, which is a little bit more palatable if you don’t need a high capacity lift. Vestil is a purveyor of great quality industrial equipment. 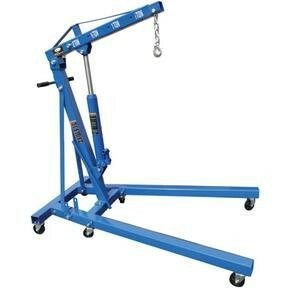 Among their product line is their portable shop crane which is designed primarily to lift engines. This particular engine hoist has a 2000 pound lifting capacity which drops incrementally to 500 pounds as you extend the boom. This should be plenty for any small car engine and medium cars. In addition, it has a telescoping boom so you can extend the chain mount out further to make for easier access to your engine without being cramped for space. It is made of all steel construction and is very sturdy. It rocks awesome yellow paint which is nicely contrasted with four black casters that allow for easily movement of the hoist. One great feature (which should be a priority) is the ability to fold the legs in to keep it tight and compact when you store it. Folding the legs up is easy as it just requires removal of a pin that supports each leg. Overall this is a great light duty offering at a very reasonable price from Vestil. It’s not the lowest, it’s not the most heavy duty, and it’s not the prettiest but it will serve any shade tree mechanic well for their engine swap pursuits. The trade for this is that it’s the smallest, lightest, and easiest to store compared to the previous three hoists that we reviewed. Lastly, it should be noted that Vestil makes higher capacity versions of the same hoist, so if you have a larger engine you need to lift, their larger lifts will serve you equally as well. Click picture to view examples of engine load levelers. No guide to choosing engine hoists would be complete without quick mention of one of the most important accessories you can have for an engine hoist: the engine load leveler. The engine load leveler, as it is most commonly called, goes by other names too including whippletree, whiffletree, equalizer bar, double tree, or leader bar. To understand the purpose of the load leveler, you must first understand the shortcomings of an engine hoist. An engine hoist has only one point of connection from which all of your chains must connect to your engine. As a result, it can be exceedingly difficult to keep your engine steady and horizontal when lifting it out of your car. To combat this difficulty, you can use a load leveler. A load leveler is essentially a bar that typically has a sliding mounting point that you can hook to your engine hoist. This allows you to easily redistribute the load of your engine. 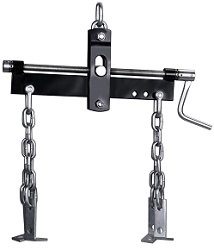 In addition, most load levelers have adjustable length chains and/or numerous attachment points that allow you to custom tailor your lifting device to your specific engine. One thing to be aware of is that they do hang below your hoist, so they effectively decrease your maximum height by a little bit. Most of the time it’s not enough to matter but just something to be aware of. While you don’t necessarily need an engine leveler to lift an engine, most people find them to be worth the cost due to the amount of time and headache they save. If you would like to see some examples of engine load levelers and associated prices, you can click this link. Well done, you are now an expert on engine hoists after making it through this article. We hope that you have found this guide to be helpful. It is always important to note that while the above engine hoists all come highly recommended, there are many other great options out there as well. If none of the above capture your attention in a meaningful way, feel free to check out a few more options, read some more reviews, and scope out prices by clicking here. Thanks for reading and happy wrenching!